Reduce bedroom clutter with this Gabrielle bed steps stool from Oh! Home. These stately bed steps are ideal for beds with tall bed frames or smaller sleepers who have trouble climbing into bed at night. The front step also opens up to reveal a spacious storage compartment for storing items such as sleepwear or children's toys. 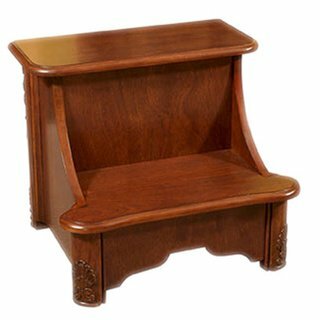 Featuring a distressed mahogany finish, these attractive bed steps are ideal for traditional or contemporary bedroom decor. The delicately scalloped front apron and intricate acanthus designs on the front posts add interesting detail and refined elegance. Crafted from a blend of MDF and rubberwood, Gabrielle bed steps are sturdy enough to withstand nightly use. If you have any questions about this product by Oh! Home, contact us by completing and submitting the form below. If you are looking for a specif part number, please include it with your message.